Let’s continue down the rabbit hole of Zombie Rom-Coms with Warm Bodies. Released in 2013, it’s a humorous take on what exactly happens when most of the world is zombified, but someone still just wants to be loved. Although this is less gory than others, it is still a zombie movie, and we do recommend discretion. 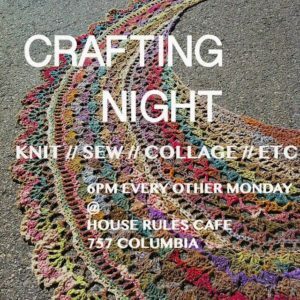 Every other Monday, join a group at House Rules Cafe for a session of crafting and discussion on our favorite topics! Be it nerdery, books, movies, local events, national events, or personal events, anything is up for grabs. All crafting is welcome and encouraged! We’ll put down dropcloths for any potentially messy activity. 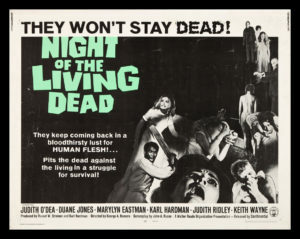 On week 3 of our zombie extravaganza, we go back to the classic: George Romero’s Night of the Living Dead. It may not have been the first zombie movie, but it is the one that defined the genre. As with the other movies this month, we would like everyone to use discretion when deciding to come watch. Zombie movies are, by definition, gory and bloody. The classics may be less so than the modern, but they are still zombies, and they’re likely to eat some BRAAAAIIIINNNNZZ. The Dresden Files, by Jim Butcher, is an entire universe of wizards, vampires, mobsters, werewolves, sorcerers, witches, and other mythical beings. 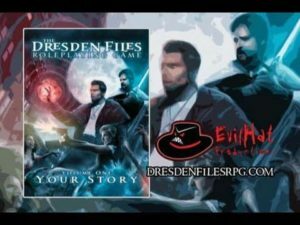 And so begins our newest RPG campaign, set in the Dresden Files universe. Urban fantasy at its best! We have a limited number of spaces for this monthly event, though there will be room for folks to join on a session-by-session basis. Players must sign up and tell us whether they plan to be regulars, or occasional. This uses the FATE system, created by Evil Hat Productions. If you have Fate Dice, feel free to bring them, but we will have all components necessary. We do recommend having a notebook and pen or pencil for note-taking and the recording of thoughts or suspicions. THE DM IS LORD ALL HAIL THE DM. (Stephen Chast) He can be found on Twitter, or wandering around this page, if anyone has any questions. We’re welcoming in Tony Cox of Kirwan’s Game Store! He’ll be introducing a fun, party-style Take That! game. Play a monster invading New York City, and battle other monsters who want to take your place as the King of New York! This game is appropriate for most abilities, though some number and reading skills are useful. This is a terrific game for families and groups.